Part 4 re-uploaded & tested. Sorry for any inconvenience! This is a superb blog. 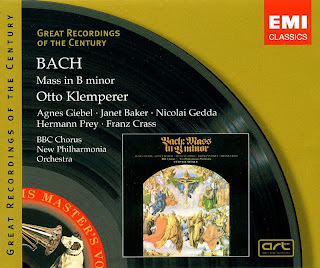 Unfortunately there seems to be a problem with Mediafire and the Klemperer/Bach B minor Mass. The downloads stop, and say "completed", without downloading the full rar files. I have tried part 1 four times and the download stopped at around 30 - 40MB each time, and part 2 stopped at 14MB. Any advice would be greatly appreciated. Personally I use FreeDownloadManager (http://www.freedownloadmanager.org/) in combination with Firefox, and that seems to prevent broken downloads 99% of the time. Downloading it now. Thanks for this wonderful offer old friend! Thrilling music on a grand scale! Thanks Edmond. I just discovered FreeDownloadManager a couple of days ago, and I can't praise it highly enough. Compared to the others I've tried in Linux, this is the *only* one to use. It's in Java, so is cross platform, as well. It does well with Mediafire for me too. The only problem is that Mediafire may block me after a certain number of consecutive downloads. I'm finding it's less likely to block me if I limit it to two simultaneous downloads. 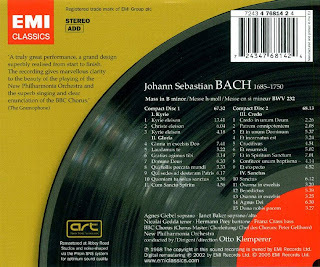 Bach's second greatest work (ranked after the SMP), but Herreweghe's versions are better. Another version I like is Celibidache's, in particular the extremely slow Kyrie.